Peter Kreeft recently wrote a post titled "Why Live Action did right and why we all should know that". There are three elements to his thesis, two bare affirmations–Live Action did right; we should all know that–and an affirmation of how any sound person would know they did right. By an intuitive judgment that is based on moral experience and on a comparison with other ways of defending person's lives (eg., spying, physical harming someone else to keep them from killing people), it is evident to most people, and to all normal human beings that what Live Action did is right, and if you think otherwise, you're morally stupid, and care about principles or moral uprightness more than about people. I'm not going to take a position on the legitimacy of what Live Action did, but I take a definite position on this manner of arguing: it is unsound, guilty of several classic fallacies, and uncharitable, arguing by ridiculing one's opponents. 1. Appeal to the people–because most people think its so, it must be so–or simply begging the question. Peter Kreeft premises: Most of my students immediately and firm conviction is that Dutchmen "were not wrong to deliberately deceive the Nazis about the locations of the Jews they had promised to hide". He then affirms that these students "know, without any ifs or ands or buts," that such Dutch deception is good, not evil, and that anyone who is more certain of a universal philosophical principle, from which he would conclude that such deception was wrong, "is not functioning as a human being but as a computer, an angel, a Gnostic, or a Kantian." When we discuss Kant and the issue of lying, most of my students, even the moral absolutists, are quite certain that the Dutchmen were not wrong to deliberately deceive the Nazis about the locations of the Jews they had promised to hide. … They know, without any ifs or ands or buts, that such Dutch deception is good, not evil. If anyone is more certain of his philosophical principles than he is that this deception is good, I say he is not functioning as a human being but as a computer, an angel, a Gnostic, or a Kantian. Here Kreeft is either (1) begging the point at issue, using his students merely as a illustration of that which he takes as a fact anyway, namely that whatever deception was realistically necessary to save lives (whether one uses the term "lying" or not) was good, or (2) arguing from the fact that the intuition of most persons is in favor of lying in such situations. 2. Begging the question and ridiculing your opponent: "Physical hiding and verbal hiding are two sides of the same coin, whether you call it lying, or deception, or whatever you call it. What it is, is much more obvious than what it is to be called. It’s a good thing to do. If you don’t know that, you’re morally stupid, and moral stupidity comes in two opposite forms: relativism and legalism. Relativism sees no principles, only people; legalism sees no people, only principles." 3. Argument by ridiculing your opponent: "If lying is always wrong, then it is wrong to lie to a nuclear terrorist (the “ticking time bomb” scenario) to elicit from him where he hid the nuclear bomb that in one hour will kill millions if it is not found and defused. The most reasonable response to the “no lying” legalist here is “You gotta be kidding”—or something less kind than that." 4. Argument from analogy, which, however, reduces to the previous fallacies, either appeal to the people or a begging of the question). The genuine morality of what Live Action did is the same as that of spying in order to save lives. But spying in order to save lives is morally right. Therefore what Live Action did is morally right. The closest analogy I can think of to Live Action’s expose of Planned Parenthood is spying. If Live Action is wrong, then so is all spying, including spying out the Nazis’ atomic bomb projects and saving the world from a nuclear holocaust. This is a logically valid argument. Kreeft does not argue for the premise that spying is morally licit, but this premise is probably not disputed by those whom he is opposing. The more questionable premise is his supposition that the morality of spying is the same as that of lying. He does not give any argument for this, thus it is either simply assumed (begging the question) or assumed on the basis of majority opinion. Peter Kreeft does give a certain argument in favor of the use of the argument from majority opinion in moral matters: because they deal with concrete realities, "moral experience, instinctive moral judgments about concrete situations by our innate moral common sense" has priority over "clear definitions of general moral principles and valid logical reasoning from them"
Several questions pose themselves in regard to this: (1) what do we do when faced with a moral situation, such as that of lying to save someone's life, where the instinctive moral judgment says it is morally right, and the instinctive moral judgment of others says that it is morally wrong? If we say that the instinct of the majority is right, it seems we would have to say that the use of artificial contraception is morally right, a conclusion Kreeft would not accept. In the Aristotelian and Thomistic account, it is not just anyone's instinctive judgment which is decisive, but the judgment of the virtuous man? Is Kreeft so sure of his virtue that he can say that one who denies that his instincts are correct are "morally stupid" and is "not functioning as a human being"? (2) What do we do when faced with a moral situation where, when the situation is presented in one way, we have one instinctive moral judgment, and, if the situation is presented in another way, we have a different instinctive moral judgment? I hope to return to the question of instinctive judgments and moral reasoning in a later post. See also: A Response to Peter Kreeft, On Lying, posted on the New Theological Movement Blog, and Augustine vs the Priscillianists by Mark Shea, two other responses worth reading. Can the desire "to become perfect," to grow in holiness, be one's motivation for being ordained a priest? On first consideration, this might seem totally inappropriate, as the priesthood is not given in the first place for a man's personal perfection, but in order for him to serve Christ, as his representative. Thus, St. Alphonsus Ligouri, while he describes the right motivation for religious life as "to bind oneself more closely to God, or to correct the transgressions of one's past life, or to fly from the dangers of the world," describes the right motivation that is a sign of a vocation to the priesthood differently, saying that one should desire "to serve God, to spread his glory and to save souls." This difference between religious life and priesthood, namely that religious life is directly ordered to a personal and real conformity with Christ, to perfection in love of Christ, and thereby to the service of the community and building up the Church in love, while the priesthood is directly ordered to a sacramental and representative conformity to Christ, to the service of the community in Christ's name, is a real difference, and does imply that one's motivation for the priesthood in a certain sense cannot be primarily for one's personal perfection in the Christian life. However, this sharp division (personal perfection in Christian life, service of the Church, etc.) is not the concrete way in which a vocation is usually experienced. The Apostles did not know in all specificity what they were being called to when Christ said, "Come, follow me." They were attracted by his person or inspired by his mission, and they followed him both to be with him and to accompany him on his mission. In most cases, a person perceiving a vocation cannot define his motivation to embrace that way of life in terms of a very precise single goal. He chooses the way of life as a whole, with all that is included in it. Now, is a special call to perfection included in the priesthood? It is. John Paul II, in Pastores Dabo Vobis, says that priests "are called not only because they have been baptized, but also and specifically because they are priests, that is, under a new title and in new and different ways deriving from the sacrament of holy orders" (n. 19). And Vatican II says, "Since every priest in his own way represents the person of Christ himself, he is endowed with a special grace. By this grace the priest, through his service of the people committed to his care and all the People of God, is able the better to pursue the perfection of Christ, whose place he takes" (Presbyterorum Ordinis, n. 12). The awareness of this special calling and grace, often concretized by experience of holy priests, can be included in the discernment and decision to offer oneself for the priesthood, to seek ordination. Whatever the special aspects of priestly life that initially attract one to it, what is essential is that it be embraced in its totality. E.g., one person might, prior to any thought of the priesthood, be drawn to celibacy, to devote his life to the things of God, and through this desire come to desire the priesthood in particular. Another person might not at first be particularly drawn to celibacy, and first find his vocation to it in his desire to serve others in the ministerial priesthood, which in the Roman Rite is connected with celibacy. (In this latter case it is nonetheless important that he come to appreciate the proper value of celibacy and to embrace it freely, and not only as a extra obligation he has to submit to in order to be a priest. But that's matter for another post.) Similarly, the "path to perfection" of the priesthood might be for one person an important aspect of his initial aspect desire for it, while for another person it is not, and only in his desire for and commitment to living a good priestly life that he sees in that way of life his path to perfection. What is the object of discernment? Does discernment mean only finding what is best among options that are all good? Or does it refer also to distinguishing morally good choices from morally bad choices? As noted previously, Fr. Peter in his article on discerning personal vocation, attributes to discernment only the apprehension or determination of the best out of several good choices. First we should consider the meaning of the word "discern" and "discernment". The fundamental meaning of "discern" is to mentally or sensibly distinguish something from others. And of course we should not only distinguish the best choice from other good choices, but should, indeed must distinguish good choices from bad choices. So discernment does include also, as most fundamental, perceiving the difference between what is truly good and what only seems so, between what truly comes from God or leads to him, and that which comes from our selfishness or leads away from God. St. Paul also uses the term this way: "solid food is for the mature, for those whose faculties are trained by practice to discern good and evil" (Heb 5:14). In another traditional text linked with discernment, St. John says, "do not believe every spirit, but test the spirits to see whether they are of God" (1 John 4:1). Here the main distinction to be made is not between a spirit that moves one to something good, but not all that good, and a spirit moving one to the best ways of thinking and acting, but the fundamental distinction or discernment to be made is between the good Spirit, the Spirit of God, and an evil or false spirit, which is not from God. It is important to bear in mind this general notion of discernment, in order to avoid making it excessively obscure and mystical. Of course, when the question is discerning God's will, there will always be some mystery, because God himself is a mystery to us, who walk by faith. Nevertheless the connection between discernment and ordinary Christian prudence is important for the practice of discernment. The ordinary means of discernment is prudence enlightened by faith and motivated by charity, the "faith that works through love" (Gal 5:6). The Catechism of the Catholic Church says, "When a prudent man listens to his conscience, he can hear God speaking" (n. 1777). 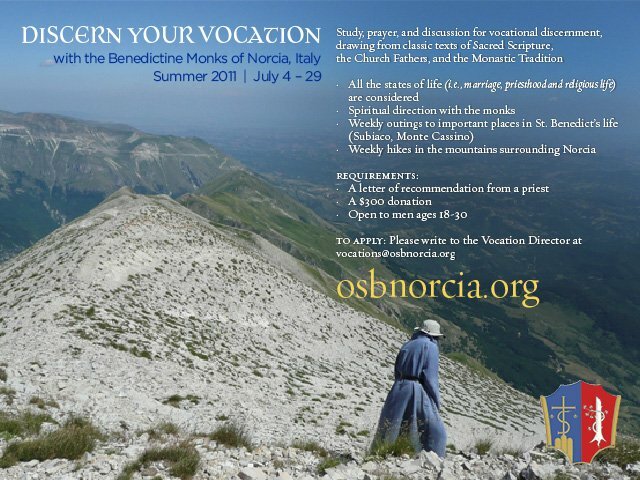 And Vatican II says about priestly vocation: "The voice of the Lord who is calling should not in the least be expected to come to the ears of a future priest in some extraordinary manner. Rather, it is to be understood and discerned by those signs by which the will of God is made known daily to prudent Christians" (Presbyterorum Ordinis, n. 11). Fr. Philip Powell gives some good practical points, and questions that those discerning a religious vocation should ask themselves. These questions to ask when discerning a vocation may be found, together with comments on the Anti-Christ, and the difference between magic and prayer, at his blog Domine, da mihi hanc aquam!